This week I'm joining many other authors in the World Building Blogfest hosted by Sharon Bayliss. Today I'm sharing a map* of the world in Elemental Attraction series and explaining a bit about each country. On the right side, we have the country of humans, Hendola. 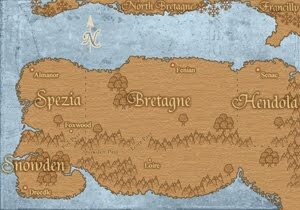 To the west of humans is Bretagne, the country of demons and angels. Bretagne's neighbors are the devils from the country of Spezia. Also shown is North Bretagne and Francilly. Neither has been spoken about in length in a book yet. North Bretagne is, of course, a part of Bretagne. And Francilly is a country of only pale-type angels. (It's the reason Amer and Sucre speak French.) The northern countries have snow icons because it's cold up there. In Water Waltz, Varun and Triste live in Fenian and visit Senac. In Fire Tango, Leandre and Fremont live in Fenian and travel to Foxwood. As a devil, Fremont is originally from Spezia but calls Bretagne home despite the prejudice he receives. Loire is mentioned in Fire Tango but not visited. (Riston and Pekelo are originally from Loire.) I'm working on a third book which takes place in Loire, so I'm getting to really build the world more as I expand into the southern area. Almanor, Fenian, and Senac have similar climates with four seasons. Snow is common in the winter. The summers are humid and warm, but cooler than the southern cities of Loire or Dreedle. Snow is rare for Loire and Snowden in winter. Come back tomorrow when I discuss the history and politics of the Elemental Attraction world. I'll have another map to illustrate the borders before Bretagne took land from Spezia and Hendola through war. Thanks for the link to the map maker! I've been wondering where all these awesome maps came from. Sounds like a fascinating world! Good to meet you! idk where others have done their maps, but I used Celianna's. It was so much fun. Good to meet you as well! This hop is a fantastic idea.